My name is Paul Johansen, and I currently serve as the vice president of product and chief technology officer at Edmentum, overseeing talented groups that have the exciting responsibility for delivering our online solutions to our customers. In my spare time, I enjoy volunteering in my children’s school district, where I’ve recently helped design a K–6 coding curriculum and where I also serve as a member of the district innovation team. I also coach a local FIRST LEGO League robotics team and hold leadership roles in my sons’ Cub Scout pack and Scouts BSA troop. Edmentum’s Volunteer Time Off (VTO) program gives employees the opportunity to spend some time each year volunteering in our local community and giving back to the students we impact on a daily basis. Before our VTO program came to be, our Product, Technology, and Experience team had hosted previous volunteer events with great success and enthusiasm. This year, we wanted to create a volunteer opportunity for our team that highlights some of the skills that we already hold and use in our roles on a daily basis, namely software development, experience design, and coding. The website Code.org hosts an event called the Hour of Code every year during the first week of December. The nonprofit event is funded by huge software companies like Facebook, Google, and Microsoft. The event is intended to introduce students to the concept of coding in a fun and exciting way and to show them that it’s not as intimidating as many people think. This event hopes to spark some interest in software development and coding in students and inspire them to pursue future careers in this field. The Hour of Code brings equality and access to coding resources to students who maybe wouldn’t have had an experience to try these skills out otherwise. With all this in mind, we wanted to find a local school in Minnesota and reach out to sponsor an Hour of Code. To begin our search for the perfect school to host this event, we went onto the Hour of Code website to see the schools who had registered, showing their interest in an Hour of Code event. Through our search, we landed on Jackson Elementary School in St. Paul, Minnesota. Jackson Elementary is part of Saint Paul Public Schools, a district where many of the students come from disadvantaged backgrounds. A large percentage of students face challenges such as English not being their first language, poverty, and homelessness. The staff at Jackson Elementary has been working hard to provide students with valuable experiences and exposure to potential career fields, connections with community mentors, and demonstrations of the great potential that is inside each student. With all this in mind, Jackson Elementary could not be a better fit for us to host this event, and we were excited to reach out and get started. I contacted the school’s principal, who then referred us to the media coordinator of the school, Tess Haberman. She was excited to partner with us to bring an Hour of Code event to her students at Jackson Elementary. She had registered for the event but had not yet planned the specifics of the event, so she was very welcome to partner with Edmentum to host the event. One of our talented principal software architects and St. Paul Public Schools parent, Mike Koch, and I visited Ms. Haberman at Jackson Elementary. We devised a plan that included Edmentum bringing the necessary supplies, planning the curriculum, and providing enough team members to help out during the day. Mike and I came back to the rest of the team and shared what we had learned with them, asking for volunteers. We were met with tons of enthusiasm and willingness to participate from the rest of the team! There were about 25 people who signed up, and through that, we identified several different team captains to break the groups into smaller sections. Each team captain came up with a different set of coding activities for the students. 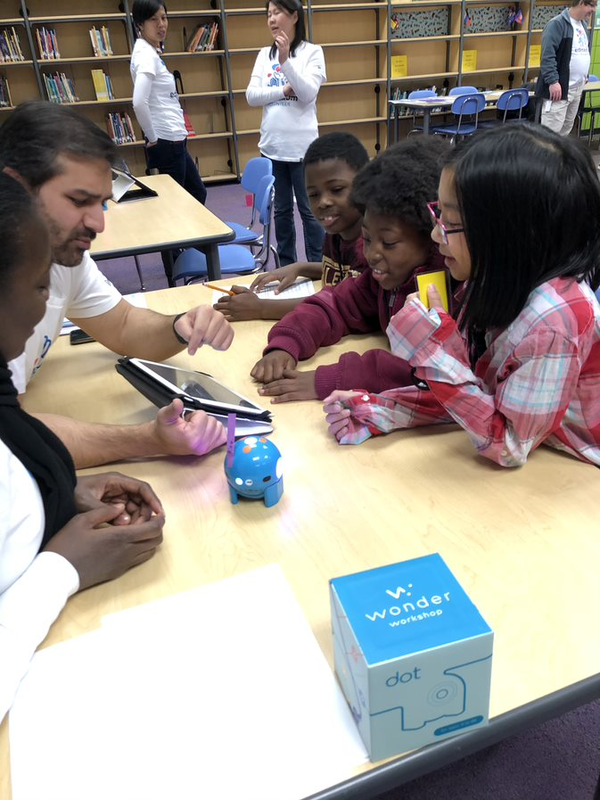 Through some other volunteer opportunities that I had participated in in the past, I observed that young students loved coding activities that connect them to the physical world, like seeing a robot move after programming it. I had had specific experience with devices called Wonder Robots, so Edmentum purchased a set of these to not only bring to Jackson Elementary but also donate to the school for continued coding activities long after the Hour of Code concluded. On the day of the Hour of Code, we separated our activities into three groups: activities in the computer lab, activities that involved the robots, and paper-based activities. The school helped separate students into different groups, and each group of students rotated through each activity. The majority of participants in the event were students who stay after school for care until their parents can pick them up at a later time, so these children were excited to switch up their routine and have some fun. Between 25 and 40 students participated in our Hour of Code. One thing that we know about students in classrooms (and from personal experiences) is that when students run into a problem—if they if they can't log in or if they don't know how to get to the next screen—it stops their progress, and a single teacher or even a handful of teachers have a hard time getting to all of the students. Another thing about this event that was nice was that we had almost as many volunteer mentors as there were students. So, anytime any participant got stuck, there was somebody there to help. Especially with a big group of students like that, it can be easy for students to get stuck, thus halting their focus and bringing them off task. With the large group of volunteers that we had, we were able to keep all of the students focused the whole time. All of them were engaged, and it was very cool. Our team had an absolute blast with the students. The enthusiasm that the students brought was amazing to see in action. We were all so impressed at how fast they picked up things and how motivated they were. The experience was absolutely rewarding, and the gratitude of the students and teachers was communicated to us over and over throughout our time at Jackson Elementary. The students ended up sending us thank-you cards, and they were excited to hear that they were able to keep the cool robots that they had been playing with that day. It is an experience that I and the rest of my team will not soon forget. Looking to hear more stories of how the Edmentum team gives back to communities? Check out this story roundup of how four team members spent their VTO time! Paul is Vice President of Product and Chief Technology Officer at Edmentum overseeing talented groups that have the exciting responsibility for delivering our online solutions to our customers. His teams manage our comprehensive product portfolio, design our world class user experiences, develop our technology platform and operate our data centers. Paul loves to spend time out with our customers and stays active in his children’s home district where he recently helped design a K-6 coding curriculum and is a member of the district innovation team. Paul has degrees in Computer Science and Marketing from the University of Minnesota and an MBA from MIT. He has been with Edmentum since 2009.